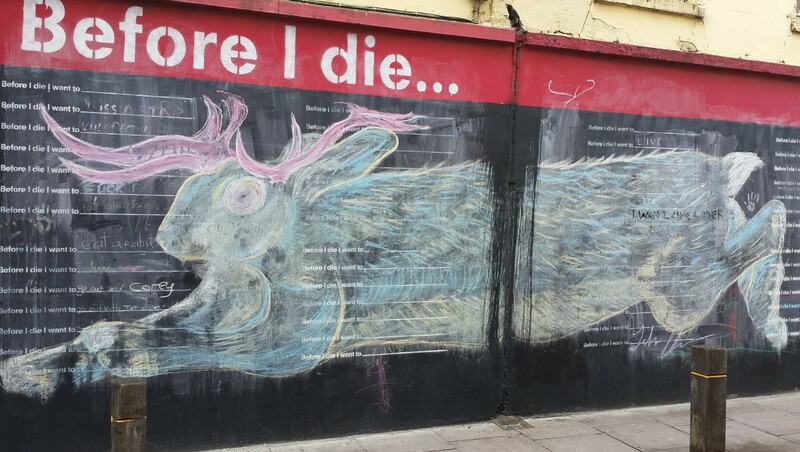 A public list in Cork, Ireland. The bucket list, supposedly named for the stuff you need to do before you ‘kick the bucket’, is a great tool for planning your goals; be it reading, places to see, dishes to cook or books to read. For reading, I keep several lists that I have compiled over time (divided by topic/interest). I do kinda like the Amazon 100 Book to Read in a Lifetime list, but only because its aim is long enough for me to actually get through it. I have like 40 years left to get through the last 94. If anything, I only have a problem with “official” lists. Sanctioned lists of anything has, by necessity, a specific aim in mind. Whether it’s to promote a specific type of literature, a philosophical ideal, political agenda, a holiday type or something else entirely, it feels conformist and constructed. And it only applies to the ideal reader, or rather their ideal reader. Who probably isn’t you. A bit like you maybe, but not you specifically. However as the ideal reader, you might get something special out of them. Finding a list of 101 Whiskies to Try Before You Die could be ideal for the enthusiast for instance. Ideal reader aside, writing a bucket list can be a rewarding experience. Not only in realising what you want to spend your limited time on, but also in realising what is actually out there. The best lists are introspective, research-driven and creative, combining your ambition with real life facts, and looking forward. They are planning tools first and foremost. The amazing experiences come after that, when you get your rear in gear and get going. For how to write a bucket list, the WikiHow page is pretty good. Go have a read. Now, I do recommend jutting down 50 books to read, but like anything else, it should be subject to change. There is little good about making a list and getting to it, only to find out that you hate some part of it. Like attempting Tolstoy’s War and Peace and falling asleep 10 mins in, or wanting to read ALL of the classics and realising that classics are really old fashioned. Your list, like you, is a living breathing thing. It reflects aspects of you and as you change, it changes. So be prepared to change your list. If something doesn’t fit, cut it out. Personally I keep a list of books to read at all times, with a sub list of books that I previously wanted to read and might want to read again. Some of them are listed on my Goodreads profile here. Now please note: this is not an endorsement to give up when things get tough. It’s to realise whether or not the investment made in time and effort will pay dividends later on. It’s up to you to decide when to push on, and when to throw in the towel. My lists will continue to change as I change. But what do you think? Should a bucket list remain static or should it change over time? Or is it pointless to even have one? Let me know. Next post will be up on Saturday the 2nd of May (around 16:00 GMT). I also gave up on the Bible. The Book of Proverbs is quite good though.